Are you hosting Thanksgiving Dinner this year? Thanksgiving is a traditional day of giving thanks and enjoying the company of family and friends. For some we carry on traditions our mothers and grandmothers taught us. For others it’s a day to start new traditions or update the old with a modern, new twist. For many hosts, Thanksgiving will be the biggest event of the year. 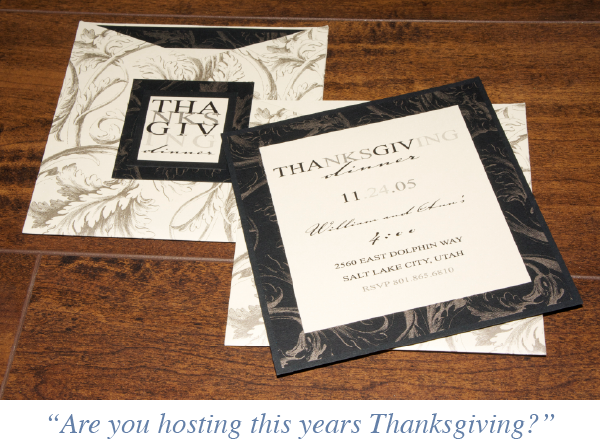 Celebrate the significance of the occasion by mailing an invitation to guests to attend Thanksgiving Dinner. It is a heart warming way to show loved ones you're planning a special dinner and you want to share this day with them. Plus, it may just become one of your updated Thanksgiving traditions. In the first picture below we have a layered pocket card with a bold graphic for “Thanksgiving Dinner”. This invitations gets an A+ in my book for elegancy and beauty! For a smaller budget or a super quick turn around, it's easy to change some wording around and convert any one of our pre-designed Thanksgiving Cards into an invitation to Thanksgiving Dinner. Browse our pre-designed collection of Thanksgiving Cards at simpleinvitations.com featuring an assortment of tasteful cards. To create an invitation catered to your Thanksgiving give the experts at Ann Elizabeth a call and we’ll help you in creating a new tradition at your house!